Camelopardalis the giraffe, is one of those constellations that goes unnoticed for the most part. Lying close to Ursa Minor in the north, this constellation is circumpolar and is visible any time of year but lacks the WOW objects like those belonging to Orion, Andromeda.etc. 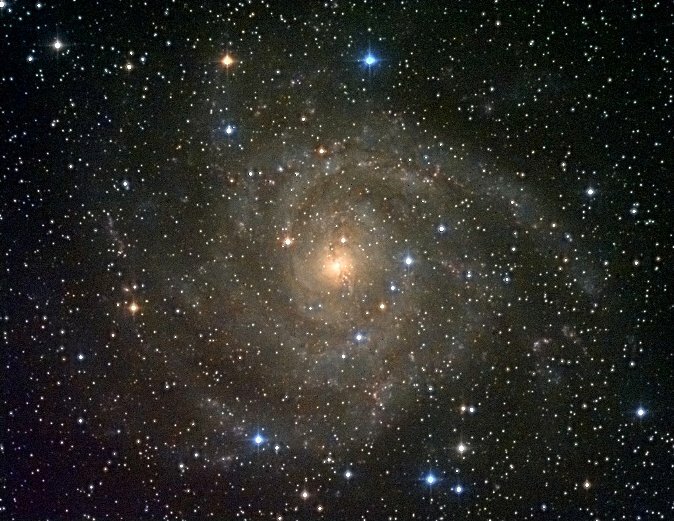 Camelopardalis is spread over 757 square degrees of sky and is listed 18th in area. The Giraffe is home to 53 NGC objects, most of which are galaxies. As for bright stars, you would be out of luck. Most of its suns are in the fourth magnitude range. Camelopardalis is a modern constellation dating back only 400 years and lacks the traditional ancient star names as seen in other asterisms. Since it is a newby in the sky, it does not even have a mythological story associated with it. As we have seen in other constellations, the alpha star is not always the brightest. Alpha Camelopardalis is listed at magnitude 4.4 whereas the beta star is a bit brighter at 4.2. Alpha Cam is a blue-white class O bright super giant star located 3,200 ly from us. Spectral type O stars are pretty rare. Astronomers believe Alpha Cam may be a runaway sun from the nearby associated cluster NGC 1502. On the other hand Beta Cam listed as 1,000 ly from us, is a yellow white supergiant star whose surface temperature is a bit cooler than our Sun’s photosphere. This star’s luminosity is some 3,300 times our Sun. Located about an arc minute to the west of Beta Cam is a double star whose components have spectra of A and F. These stars are physically separated by twenty-five thousand astronomical units or less than half a light year. Calculations show that it would take a million years for this double star system to orbit once around Beta Cam. The open cluster NGC 1502 is listed at magnitude 5.7 and contains about 15 stars including a couple of doubles names Struve 484 and Struve 485. NGC 1502 is also one end of Kemble’s Cascade. This string of stars might seem to be from the same group but the Cascade is only a chance lineup of varying distant suns. It does make for impressive photography. One and a quarter degrees from NGC 1502 is an irregular planetary nebula. Commonly known as the Oyster Nebula catalogued as NGC 1501, its magnitude 14.5 Wolf-Rayet star is embedded in a bluish halo. At 4,800 ly away NGC 1501 is more than four times farther and 3 times larger than the famous Ring Nebula. NGC 2336 is a well structured galaxy with numerous delicate arms. It is listed as magnitude 10.9 and rests some 110 million ly away. NGC 2336 does have the distinction of being the northern most galaxy closest to Polaris. NGC 2715 is another tilted galaxy with detailed arm structure. 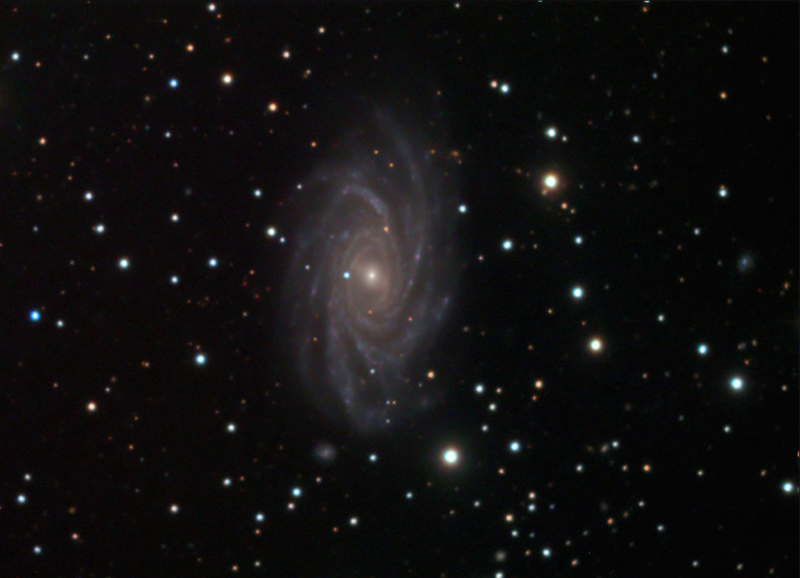 This SBc galaxy glows at magnitude 11.4. 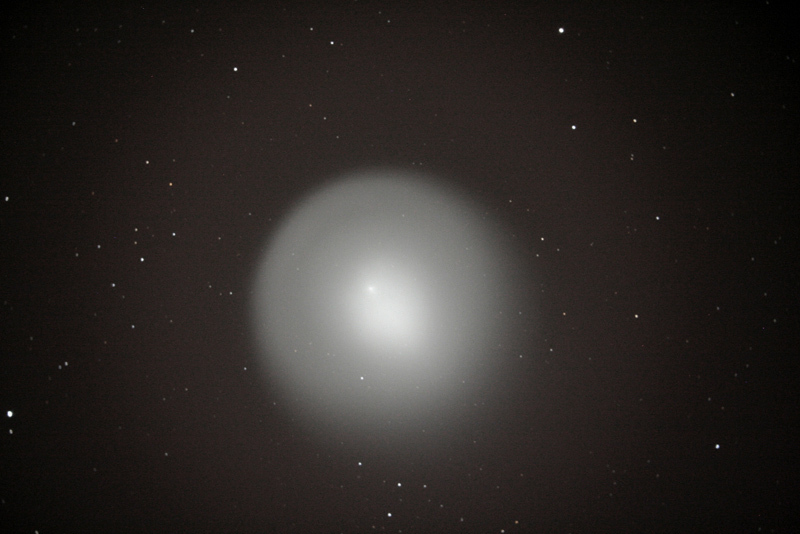 NGC 2715 measures 5 arc minutes of sky and is an estimated 62 million ly away. For a change, we will look at a large, loosely structured galaxy. NGC 2403 can be seen in binoculars from country skies and with a magnitude of 8.4, sometimes fools comet hunters. 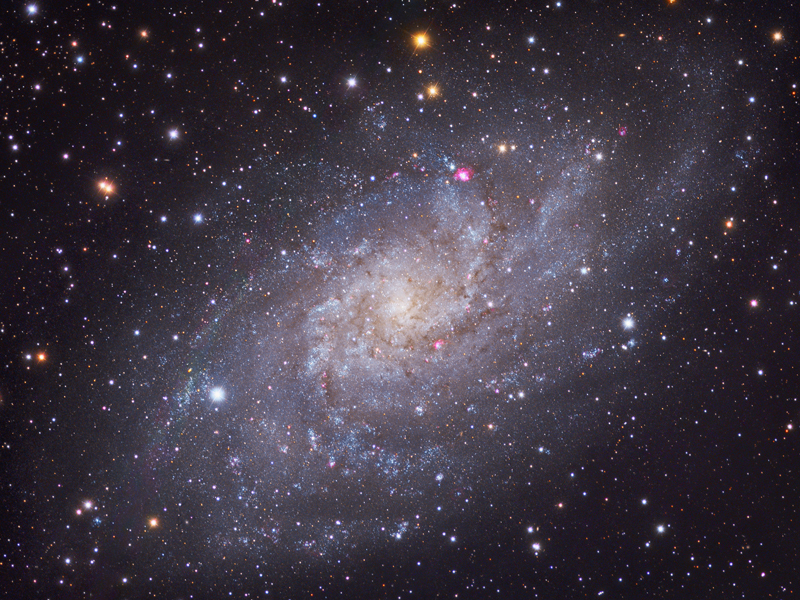 NGC 2403 possesses about 100 emission regions as well as 27 variable stars. Its distance is thought to be some 8 million ly. Larger instruments will reveal many of these regions that seem to take on likeliness to M33. Two supernovae have been spotted in this galaxy, one in 1954 with the other, a half a century later in 2004. Nestled within the small asterism, we find IC342. This lovely face on galaxy lies at an estimated 10 million light years (ly) from us. Measuring about two-thirds the diameter of our Moon, IC342 glows at magnitude 9.0 and displays its majestic arms. Because it is located close to the galactic equator, interstellar dust is obscuring its true brightness. Without this junk in the way, IC342 would be an estimated 2.4 magnitudes brighter and therefore, quite evident. Comet Lulin is currently putting on a great show in our southern skies. Moving from Libra into Virgo, our interstellar visitor continues to brighten and will be naked eye from dark locations. Just like Comet Holmes, Lulin takes on a greenish colour but this comet is unique in the sense it has a tail and an anti-tail (a tail pointing in the opposite direction from the main tail). Comet Lulin swings close to Spica on Feb 15/16 and appears below Saturn on Feb 23/24. In fact the night of the 24th will see its closest approach to us and will be .41 astronomical units from us or about 61 million kilometers away. Its bright coma currently measures some 500,000 kilometers wide. The first of two planets putting on a show is the brilliant Venus as it dominates the western sky. It beams at magnitude -4.3 but is now reseeding in a westerly direction. Since Venus lie inside Earth’s orbit, the planet undergoes phase structure like the Moon, a telescope will reveal a lovely crescent phase that will only get larger but thinner. You have to see it to appreciate it. Saturn is the other planet putting one a great show. As weeks and months tick by to the September ring crossing, the famous ring system has all but vanished from view. Only a sliver of icy rings are evident but we have an excellent opportunity to pick up its many moons. February is one of the few months without a meteor shower. 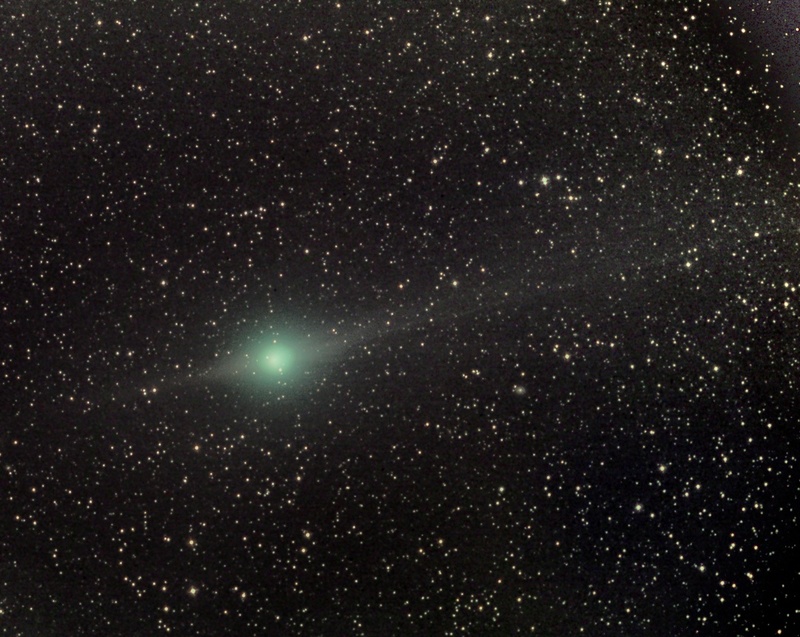 On that topic, the next display will be the Lyrids on April 22nd. The ZHR is only 10 to 20 meteors.